Between the entertainment hub of Patong and Surin Beach, both only 10 minutes away, Kamala is an intimate bay in the perfect location to allow easy access to other areas. 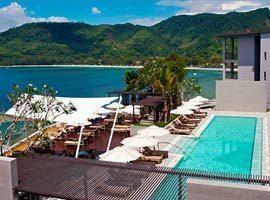 It is not nearly as busy as Patong or even Karon, but certainly not secluded. It is clean and relaxed, offers abundant restaurants, evening entertainment and a village with many conveniences and an up-beat atmosphere. 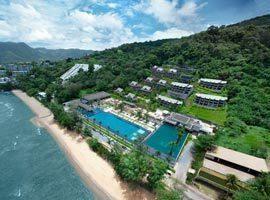 If this sounds like your kinda place we list the best hotels in Kamala Beach Phuket with great accommodation deals. 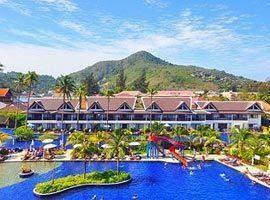 Apart from the fluffy ribbon of white sand the area is home to one of the island's top attractions namely the Phuket FantaSea, south east Asia's own Disneyland and there is also a Friday market at which to bargain for goods. Located in this charming bay our beachfront resorts cater to every style and budget including luxury 5 star family accommodation in the 2 and 3 bedroom villas of places like The Bell and Paresa Resort. If the kids are still small the Sunwing resort and spa is one of the best places to stay without ruining your budget with all the bells and whistles to make life convenient. That this is a great location for couples goes without saying and hotels like Cape Sienna and Ayara has the perfect romantic accommodation. 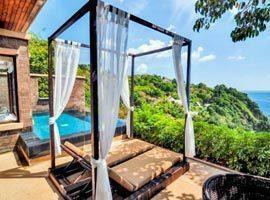 Located on a rocky slope directly above the blue waters of Kamala Bay it offers deluxe ocean view rooms, rooms with spa baths and direct pool access as well as one and 2 bedroom pool villas. Awarded the best romantic hotel in Asia in 2010 Cape Sienna is chic and trendy offering dramatic ocean views from each of its deluxe jacuzzi rooms, penthouse pool suites and private beachfront pool villas. Located on the slope of a steep hill Hyatt Regency offers rooms with private balconies featuring splash pools or jacuzzis. Almost all rooms offer panoramic ocean views. Offers a spa, cooking classes and gym. 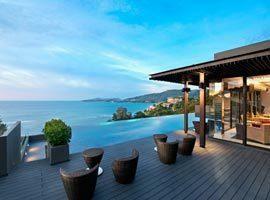 Paresa Phuket offers luxury accommodation for every requirement, including 3 and 4 bedroom family suites. 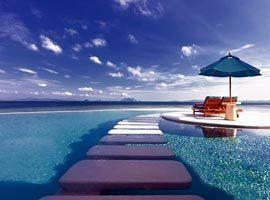 The Aqua, Cliff and Dima Suites are romantic and offers infinity edge pools. Affordable family friendly hotel without compromising high standards. Offers kids suites with thoughtful extras for small children and babies, a spacious 2 bedroom family suite and pool access rooms. 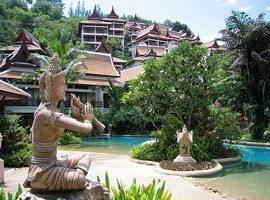 Honeymoon or family holiday, The Bell offers the ideal 5 star accommodation with an oriental design. 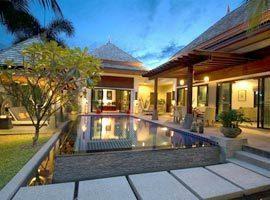 Choose from a honeymoon villa with a private pool and 2 and 3 bedroom pool villas for families. Located in a secluded, private and romantic bay The Naka offers luxury one, 2 and 3 bedroom pool villas with dramatic ocean views. Each feature a separate living an dining room with extensive facilities. 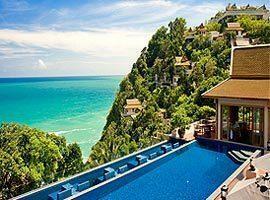 U Zenmaya is a boutique hotel located in Kalim beach near Patong and features a rooftop lounge with delectable views. Stylish rooms, including pool access rooms feature private balconies.